Today’s scripture does a good job speaking for itself; a little background might make it even clearer. This event occurs during Paul’s second missionary journey. He has just crossed over from Asia Minor and is in Europe for the first time. Paul has some traveling companions – Silas, Timothy, and Luke. Silas was from the Jerusalem church, Jewish by birth. Timothy was from Lystra, one of the cities where Paul had previously visited and preached. Timothy had a Greek father and a Jewish mother who had become Christian. Luke was a physician from Antioch in Syria, scholars like to argue whether he was Greek or Jewish or some combination. What is important is that Luke produced both the Gospel of Luke and the Acts of the Apostles. And this account, while focusing on Paul and Silas, was likely directly observed by Luke. Philippi was an important city in the ancient world. Its territory included gold mines, and a major east- west road leading across the Balkan peninsula ran through Philippi. It is located in what is today Northern Greece. It got its name from Philip the II of Macedon. Those who know their history or Shakespeare may recall that it was the site of the battle between Octavian and Brutus in 42 BC. The existing Macedonian city was re-established as a Roman Colony. As Roman soldiers mustered out, some were settled in the city. They would be granted lands and rights as their military pension. As a colony of Rome, Macedonian or Greek rules, customs, and institutions, were replaced by those of the city of Rome. The locals had no say in internal affairs. The city was ruled by two military officers appointed by Rome. Paul and his companions have been doing their evangelizing outside the city. There was no synagogue (there may not have been a large enough Jewish population to support a synagogue), so Paul’s usual method of starting in a synagogue was not going to work. Rather, Paul and his companions have found a location where people assemble to pray outside the city, near a river. They have had some success and have converted a notable cloth merchant named Lydia to Christianity. Lydia is a maker of purple cloth and her customers are royalty. Lydia allows Paul, Silas, Timothy, and Luke to stay with her. Let us hear the Good News of Salvation through Christ, and of God’s servants Paul and Silas. But when her owners saw that their hope of making money was gone, they seized Paul and Silas and dragged them into the market place before the authorities. When they had brought them before the magistrates, they said, ‘These men are disturbing our city; they are Jews and are advocating customs that are not lawful for us as Romans to adopt or observe.’ The crowd joined in attacking them, and the magistrates had them stripped of their clothing and ordered them to be beaten with rods. After they had given them a severe flogging, they threw them into prison and ordered the jailer to keep them securely. Following these instructions, he put them in the innermost cell and fastened their feet in the stocks. It is this type of saving that the jailer speaks to when he says, “Sirs what must I do to be saved?” because if the prisoners escape, he is in trouble. The punishment for a jailer losing prisoners in the Roman system was execution. When Paul and Silas respond with “Believe on the Lord Jesus, and you will be saved, you and your household,” they are talking about the deeper salvation, an idea that is foreign to Roman and Greek ears. But the desperate jailer, fearing his execution under Roman law as punishment for letting prisoners escape, gives listen to Paul and Silas. Why would he listen to these two prisoners, these two alleged Jews who had been allegedly disruptive and causing confusion in the city. Remember, the crime that Paul and Silas have been accused of by the greedy owners of the slave girl is corrupting Roman culture. What did they have that caused him to become so curious and put so much stock in what they had to say? Here’s something to keep in mind as we consider the plight of our poor jailer and why Paul and Silas could hold some sway over the man. The scripture says, “the jailer woke up and saw the prison doors wide open.” The jailer probably had an apartment, adjacent to, or directly above, the jail. Roman jails were not large; they were a place to hold someone briefly until punishment could be delivered. He probably had been hearing and grown curious when Paul and Silas were praying and singing. Given the circumstances, how could they be praying and singing? Each week, we pray the Lord’s prayer. We pray, “Thy Will Be Done.” C.S. Lewis wrote, There are only two kinds of people in the end: those who say to God, ‘Thy will be done,’ and those to whom God says, in the end, ‘Thy will be done.”1 When we mean “God’s will be done,” it is both a source of comfort and testament to our faith. Our earthly problems, while painful and scary, in the end won’t truly matter. We are saved through God’s grace; so whatever God has planned, we trust that it will be alright. Paul and Silas in their prayers are happy to have God’s will be done. They are sitting in jail after being beaten. They don’t know how it will turn out, but they trusted in their salvation through Jesus Christ and they prayed because of it. Dietrich Bonhoeffer wrote a lovely prayer called A Morning Prayer For Fellow-Prisoners. Bonhoeffer was a German Pastor and theologian. During World War II, he joined a German intelligence organization on the pretext of being able to use his ecumenical contacts to gather intelligence. In reality he was a double agent, involved in the German resistance, and involved in a plot to assassinate Hitler. He was caught and imprisoned. 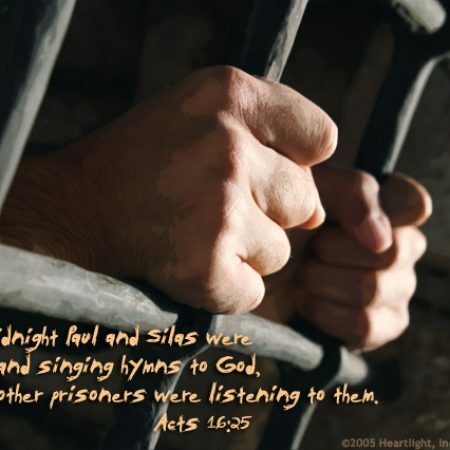 While in prison, he ministered to his fellow inmates. It is believed he wrote this prayer around Christmas in 1943. Give a listen to the first dozen lines…. The Nazi’s executed Bonhoeffer two weeks before the Allies liberated the concentration camp holding him. Bonhoeffer did not know how it would turn out, but he trusted in his salvation through Jesus Christ and he prayed because of it. Like I said before, Paul and Silas were happy to have God’s will be done. They prayed for it. And they also sang. They did not know how things would turn out, but they knew salvation through Jesus Christ, and they sang it. Babylas trusted in salvation through Jesus Christ and he sang because of it. One need not be clergy to sing through peril. As the mighty ship Titanic went down, the band, seeking to keep those still trapped aboard calm and at peace, played a familiar hymn, Nearer My God to Thee. Those singing along with the band were those who had faith. They trusted in salvation through Jesus Christ, and they sang because of it. Yes, of course, it was sung at her funeral. Those believers among her friends and family all knew Heather enjoyed salvation through Jesus Christ and we sang because of it. Of course, not every moment of praying and singing has to be a matter of life and death. Indulge me one last story this morning and we can see the two, praying and the singing, and how they met in a fairly typical way. I was in a very uncomfortable situation this week. To get an idea of what it was like, imagine waiting to hear back about a promotion and getting dragged into a round of golf with your boss and your boss’ colleagues, some of whom get a say in whether you are ready to be promoted. You might even like golf, might even be good at it, but you just know it could go really badly. I was in a similar situation. I had already had a week, I came home Sunday after church to find my internet, landline, and cable out. Monday brought a major plumbing issue. Despite my best attempts to respectfully duck the invitation, Wednesday morning I found myself at a small social gathering of clergy. I was a little anxious because a couple of the pastors at the gathering have a voice as to whether I will continue on my path toward ordained ministry. My concern grew out of one of the blessings God has bestowed upon me. God has blessed me with this amazing talent. Despite my lack of a limber body, if I am provided the opportunity, I can get my foot so far into my mouth, if I wiggle my toes, I can scratch my back. The first 90 minutes of the gathering were uncomfortable. We were having conversations that I could contribute to, but boy oh boy, was I unsure whether I should offer my two cents; but once in a while my two cents were being solicited. I counted foot in mouth attempts at one and a half, the half on account I was cut off before I could finish making a point. As the group proceeded to move into the second half of the meeting, I was desperately considering ways to excuse myself, upset stomach, fake a call from one of my kids, convert to Buddhism, you know, whatever it was going to take to get out of the room… When all of the sudden, one of the pastors in response to a quip from another pastor, spontaneously broke into song, “Softly and tenderly Jesus is calling…” we all joined in. I’d been praying, and now I was singing. When we pray to God and when we sing to God, we are putting our faith in God, our faith in the promise of the Good News being with us in our circumstances, no matter how awful, and allowing us to rest in the peace and comfort of God.